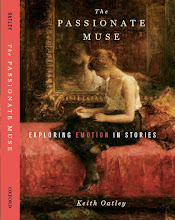 The book I am reviewing today is not a handbook—at least the title does not indicate that it is such. 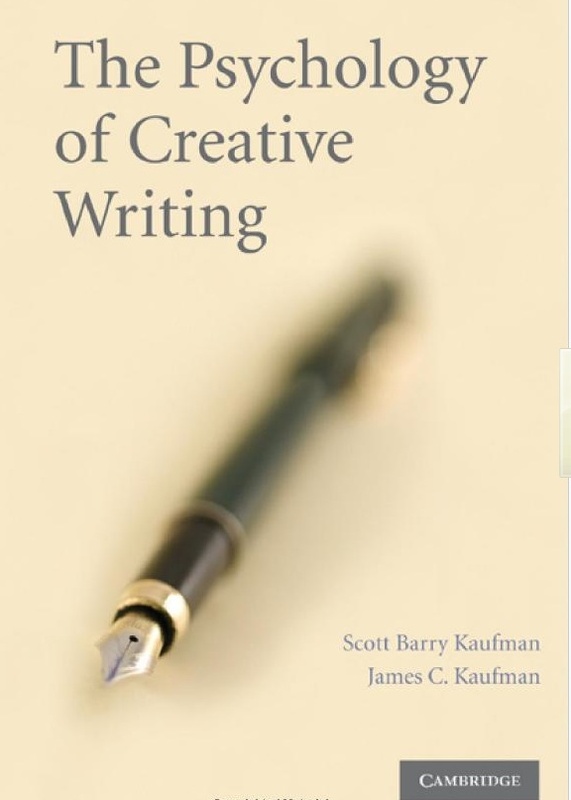 However, The Psychology of Creative Writing, edited by two accomplished psychologists interested in creativity, Scott Barry Kaufman and James C. Kaufman, functions like one. 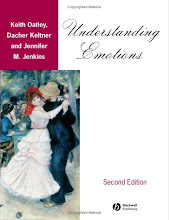 Granted, handbooks in psychology tend to run between 600 and 800 pages, while this tome runs to only 370, although A Handbook of Wisdom: Psychological Perspectives, also published by Cambridge, has only 368 pages of text, and the editors had either the audacity—or the wisdom—to call it a handbook. The point here is that I have found in the year since I acquired this book that I have consulted it many times, as I would a handbook. I’ve read articles, consulted and reconsulted references, and kept it closer to my desk than other works on the psychology of creative writing. That’s what I would call a handbook. This rich collection of papers by (mostly) psychologists who research creative writing from a great variety of perspectives offers major sections on the writer, text, process, development, and education. The section on the writer treats creative writers’ personalities, psychopathologies, mood variability and regulation among student journalists and creative writers, screenwriters’ psychological characteristics, and personality, intelligence and self-monitoring in comedy writers. All of the papers in this section are strong, but I found particularly interesting Adèle Kohányi’s discussion of her finding that both student creative writers and student journalists experienced lower mood variability than non-writers across a 14-day period of recording their emotions and their intensities. Her discussion is detailed, balanced, and the literature review is excellent. The next section, the briefest, is on the text and includes papers on the evolution of creative writing, literary creativity and physiognomy, and Shakespeare’s developing creativity as evidenced in a close analysis of the language of the plays and sonnets. Examining creative writing from an expert performance perspective, Dean Keith Simonton empirically demonstrates that, across Shakespeare’s career, he used less archaic and more colloquial words and expressions. Simonton sees this as the playwright’s drive toward originality. He shows that it is possible to predict a play’s date from stylistic qualities, and popularity is greater for those sonnets that treat a distinctive theme, employ a large number of varied words-to-total words ratio, more adjectives, more “primary process imagery” (p. 138), and use more common words in the latter part of the sonnet. Finally, he examines the question of Shakespearian authorship of those works attributed to the bard. This is the sort of exemplary article you’d want to assign to a research methodology class in either psychology or English. The section on the writing process examines stages and processes of creative writing, distributed cognition in writing, writing as a vehicle for self-expression and problem resolution, and the writing of science fiction and fantasy from a cognitive science perspective. I particularly enjoyed this last chapter in the section. Thomas B. 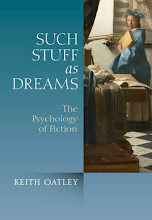 Ward and Thomas Lawson take a “creative cognition approach” in which their objective is to examine how the retrieval of knowledge at different levels of specificity and abstraction contribute to the believability of the fiction and quality of the reader’s processing of science-fictional worlds. Breadth of both specific and abstract levels of knowledge allow the writer to escape the “path-of-least-resistance” phenomenon, in which individuals “retrieve and use highly specific, basic-level instances of stored concepts when they create novel ideas within conceptual domains” (p. 198). They also explore concept combination, in which two concepts not previously joined in the mind of the writer, and likely the reader, are joined to great effect. On the whole, I found their points concerning knowledge-based constraints on writing convincing and well argued; they also happen to cite a book chapter with one of the more amusing titles around: “First sew on a tentacle (recipes for believable aliens)”. . . The papers in the section on development address flow in writing, the use of imagery to enhance creativity, relationships among pretend play, emotional processes and creative writing, and the health benefits of expressive writing. In this last chapter, Janel D. Sexton and James W. Pennebaker review much of the research paradigm undertaken by Pennebaker and colleagues since the 1980’s. The intervention used is simple: ask participants to focus on and write about a traumatic event they have experienced. The health benefits shown to follow this and variations on this intervention have been noteworthy: less doctor visits, reports of greater well-being, stronger immune functioning, reduced symptoms and medication use, improved self-image, reduced depression, and the list goes on. This line of research has also established that certain usages of language are linked to health and others not. For example, users of the pronoun “I” more often than others, tend to be less healthy and more depressed. This chapter doesn’t really address creative writing, if one takes the phrase to mean the writing of fiction, plays, screenplays, and poetry. 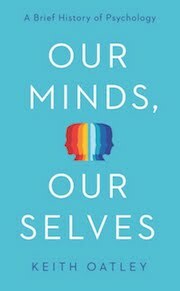 The authors do cite an older study that showed benefits to those who wrote about an imaginary trauma, and a more recent study addressing one’s writing about one’s own best possible self. Granted, these are forms of writing based upon one’s imagination of non-existent entities, but that’s not the kind of creative writing that most of this collection is about. To my knowledge, there has been no study of what a structured fiction-writing exercise based in part on Pennebaker’s intervention might achieve in health benefits. Such studies would make an important contribution to theory in the psychology of creative writing and would likely have useful practical applications as well. I began reading the last section, on education, with somewhat lowered expectations. Sometimes, in addressing the educational aspect of a field of psychology, theory exposition becomes imprecise and empirical work is not as detailed as it might be. This education section is refreshing. The theory is substantial and nuanced and the reports of empirical work rigorous in chapters on how rewards undermine creativity, the influence of the writer’s belief on the development of the writer’s persona, and the importance of the teacher’s response and evaluative techniques on student writing success. The concluding chapter, on instructing adolescents in the identification and production of creative metaphor among Chinese learners, is particularly strong empirically, and makes an important contribution to the field of creative metaphor pedagogy. I learned a lot from this book. Upon reflection, it seems to me that the only thing missing here that one usually finds in handbooks is a chapter on the history of the development of the subfield at issue. However, although there is a substantial psychological literature on creative processes across domains, and on creative writing in disciplines other than psychology, the science of psychology has only very recently (in the last 15 years) turned its methods and tools to the process of creative writing. It is an exciting time to be working in this area, and this volume a good one to have at hand. Kaufman, S. B., & Kaufman, J. C. (2009). The psychology of creative writing. New York: Cambridge University Press. Great post. Just read the book on your recommendation. Or most of it. Really helpful to me, especially in terms of thinking about the creative writing process, something I haven't studied in detail yet. I'd like to see someone test us CW folk for levels of anti-social and narcissism. Even though writing may be a social act, as some of the articles suggested, it still frequently involves spending a great of time alone. Sometimes, apparently, alone in self-focused dysphoric rumination. So are creative writers more prone to being anti-social and/or self-absorbed or is there some other explanation for why we would want to hole-up in this way? Waitman and Plucker find that the "genius" myth creates problems for novice writers. It complicates their writing process by leading them to believe the locus of control over their process lies beyond them. Might this same myth lead accomplished writers to overestimate their level of control? Or apply the genius myth to themselves? Leading to higher scores on a narcissism scale? On the other hand, it would be a relief to find that we creative writers are NOT more narcissistic or anti-social than the norm. We already suffer from mood disorder more frequently, shockingly more frequently. On the other-other hand, I may not understand those disorders very well. I'm a writing guy. Not a psych guy. Am I way off base with these questions? Thank you both for your comments, and my apologies for a late response. James, I am not aware of research on the question of a relationship between anti-social or narcissistic tendencies and creative writing. It is definitely an avenue to be explored. It could be that narcissism would be less in creative writers, in as much as creative writers have been shown to exhibit greater levels of empathy on a self-report measure than non creative writers (See the post of August 12, 2008 for details on this study). On the other hand, it has still not been demonstrated that the empathy precedes the creative writing. It could be that practicing creative writing enhances empathy. Your questions concerning the "genius" myth are quite important ones, I think. To my knowledge, there is a real lack of empirical work comparing creative writers of differing levels of publishing accomplishment on psychological factors. This is a very important next step in research on the psychology of creative writing. Thanks for the reply Rebecca! Anyway, thanks for the reply, and the blog. Fantastic insights and leads here. I'll dig deeper into that empathy research.